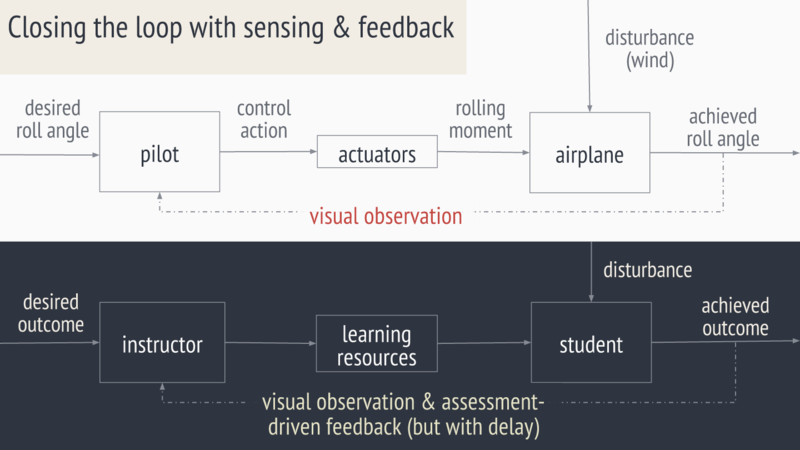 Our Fly-by-Wire project synthesizes pedagogical evidence and the aerospace-inspired analogy of digital technology for pilots to create a digital technology for instructors, enabling differentiated instruction. 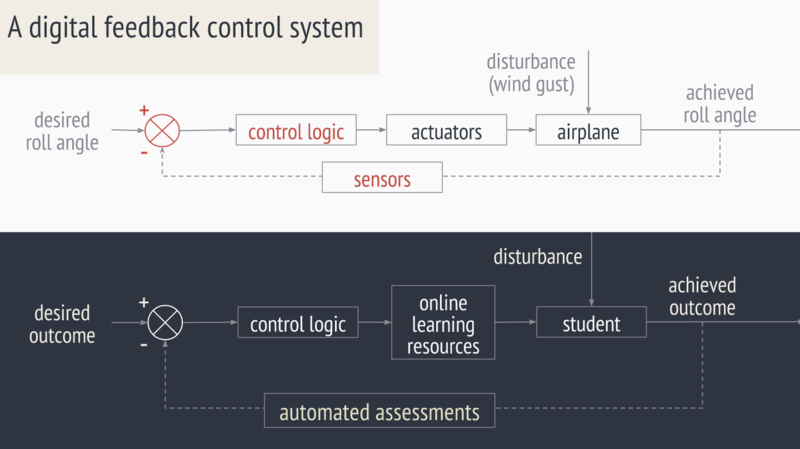 The goal of our Fly-by-Wire technology is to aid a human teacher, just as a fly-by-wire system aids a human pilot. 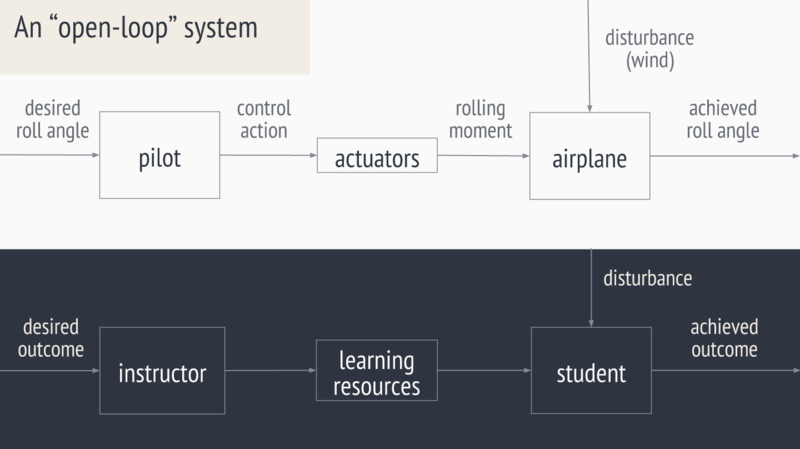 In an open-loop system, the pilot applies the control action and the actuators create the commanded action. For example, the pilot pulls on the yoke to command the aircraft to turn. The actuators are the ailerons — the parts on the back of the wing that move. The aircraft will respond by rolling to one side and turning. But the open-loop system has no feedback. The pilot has no idea whether she is achieving her desired roll angle. And the open-loop system is vulnerable: to disturbances, to variations in air conditions from day to day, to variations from aircraft to aircraft. How do we improve the airplane’s performance and robustness? We “close the loop” with sensing and feedback. 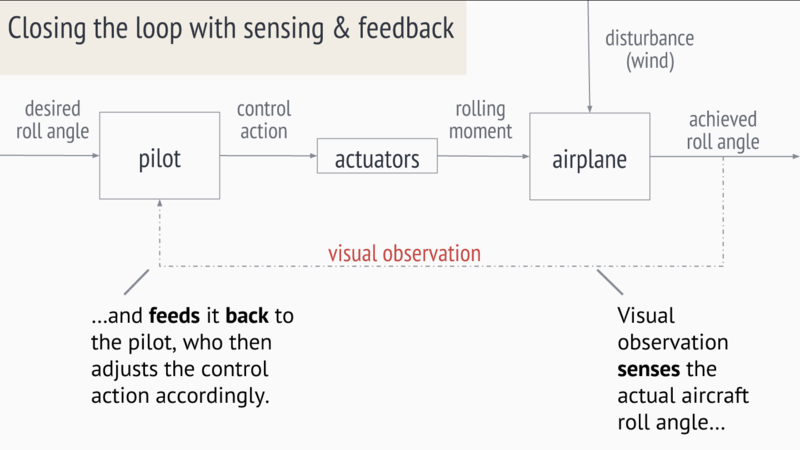 In this example, the pilot uses visual observation (e.g., of a roll angle instrument in the cockpit) to monitor how the airplane is responding. She then adjusts her control action accordingly, until she achieves her desired roll angle. Just this simple act of adding feedback can make a tremendous improvement to a system’s performance, stability and robustness (to see this mathematically, check out MIT class 16.06 on Principles of Automatic Control). In an educational setting, we also close the loop with sensing and feedback. Sensing is often done via assessments (e.g., homework assignments). However, this introduces a delay on the feedback loop – we only sense the achieved outcome days or even weeks after we tried to teach it. It is well known in engineering systems that such delays cause major problems in system performance and stability. The use of in-class concept questions and clickers is one example of “closing the loop” in an educational setting. 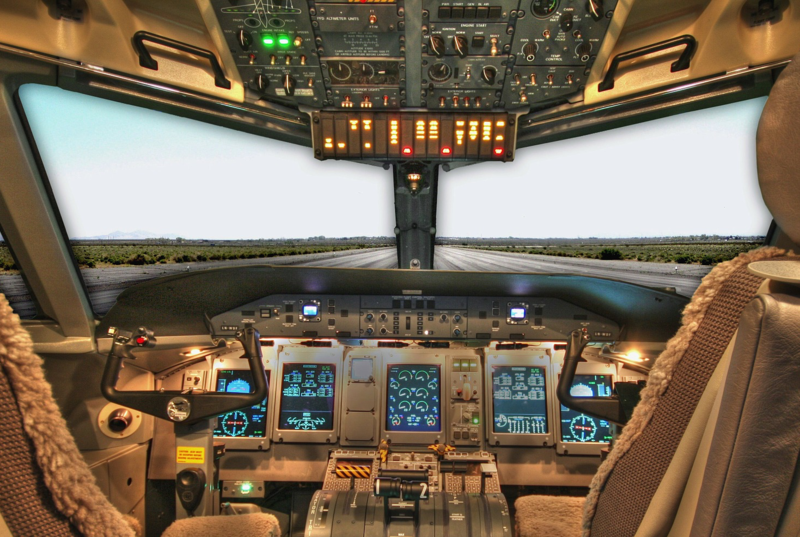 A digital feedback control system replaces the human pilot with a computer. 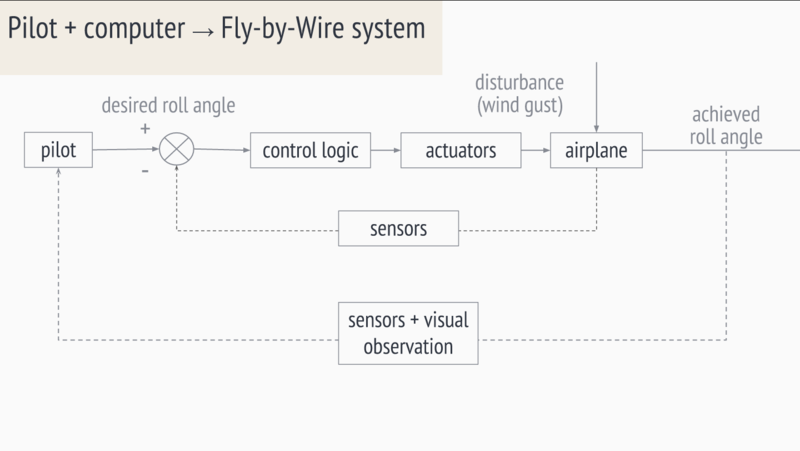 The idea is the same – sensors sense the airplane’s achieved roll angle and feed back the information. A comparator compares the desired and the achieved roll angle, then the control logic determines corrective action as a function of the error. Perhaps one day we will have the equivalent of a digital feedback control system for education. Many people are working on creating a model of the student along with adaptive assessments that would enable this. But here, we do not want to eliminate our human pilots or instructors. Back to the aircraft analogy: Fly-by-Wire technology has revolutionized modern aircraft. The idea is to combine the best parts of our human pilot and our digital control system. 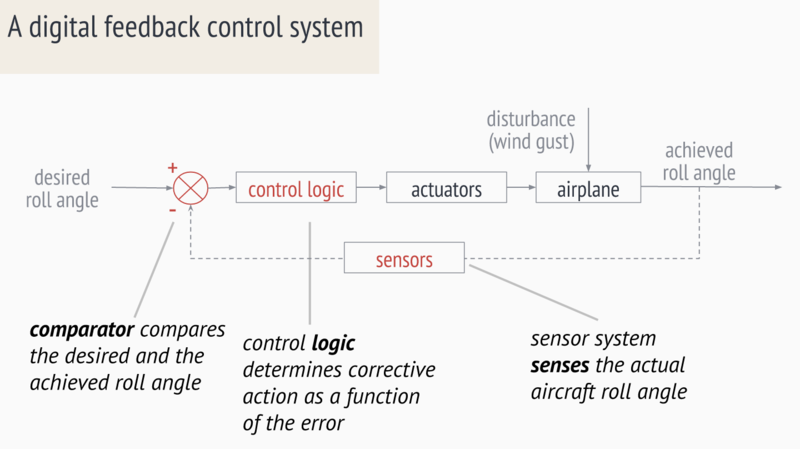 The digital feedback control system is embedded in an “inner loop.” It takes care of processing lots of sensor data and issuing rapid low-level commands to the actuators.The human pilot remains in control of the aircraft, in an “outer loop.” She issues high-level commands to the aircraft that the digital system will help her achieve. She also still uses her own sensing and feedback to bring her judgement and situational awareness to the piloting task. 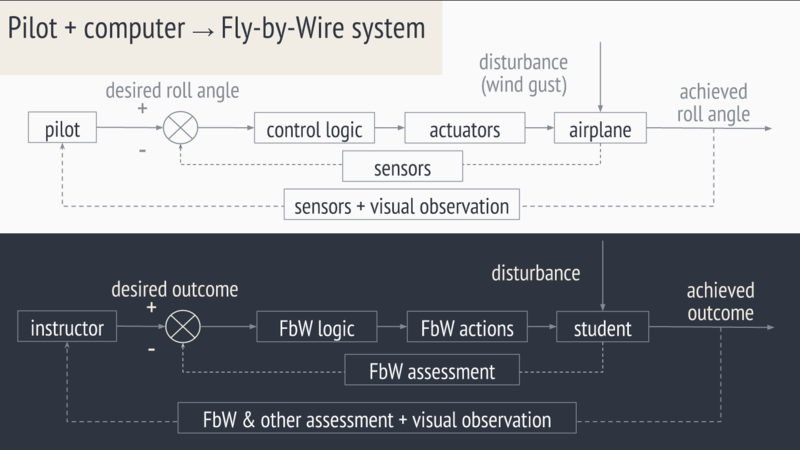 The key is that with the fly-by-wire system, our human pilot is no longer limited by her physical and cognitive capacity – the digital system can help her process data second-by-second from many hundreds of sensors and help her deploy scores of moving surfaces on the wings.